Photo: Adam Cropp eliminating plastics in our supply chains. The amounts navigator, curious and deeply concerned about the fu- of the world. Clearly, people will try to capitalize on of plastic in our oceans is horrible and we must face ture of places he visited, like Tahiti or Australia. He this. Every month, I hear some new entity coming essential change.” worried about what would happen to these pristine ar- from somewhere. The ship is only part of the equation. Capt. Cook would likely advocate the world quit eas when westerners bringing disease and destruction I know how our ships behave, but others who mimic, dumping plastics and garbage in the oceans he crossed would come and settle. Places he visited had generally will they take the same level of care?” in three epic expeditions around the globe, including happy social structures, far more so than Europe.” Lindblad is concerned the expedition cruise ship ? rst to cross the Antarctic Circle in 1773. 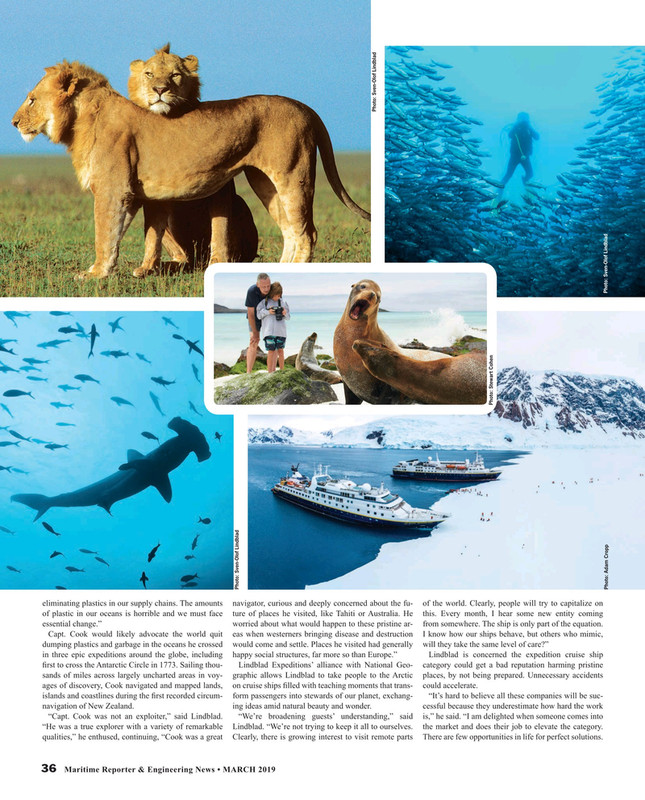 Sailing thou- Lindblad Expeditions’ alliance with National Geo- category could get a bad reputation harming pristine sands of miles across largely uncharted areas in voy- graphic allows Lindblad to take people to the Arctic places, by not being prepared. Unnecessary accidents ages of discovery, Cook navigated and mapped lands, on cruise ships ? lled with teaching moments that trans- could accelerate.